Display the image you want to edit or otherwise manipulate. Tap the Edit icon. If you don’t see it, tap the screen and it shows up. 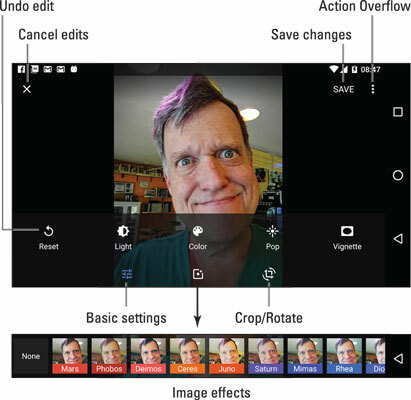 Editing tools are presented in three categories, shown at the bottom of the screen and illustrated here: basic settings, image effects, and crop. The basic settings are shown in the figure, which include an auto-adjustment tool, brightness and contrast, color, and so on. Image editing in the Photos app. Changes are applied immediately to the image. Tap the Reset icon to undo a change. To cancel everything, tap the Cancel icon. Or, when you’re satisfied with your efforts, tap the SAVE button. Individual effects may have their own Cancel and Done icons. The Done icon is shown here. Even so, you must tap the SAVE button to save the updated image.